Roaring Brook Press, 9781596430716, 50pp. In 1981 two artists -- Christo and Jeanne-Claude -- proposed an installation in New York's Central Park that would span twenty-three miles. They received a 185-page response from the Parks Department that could have been summed up in one single word: "no." But they persisted. 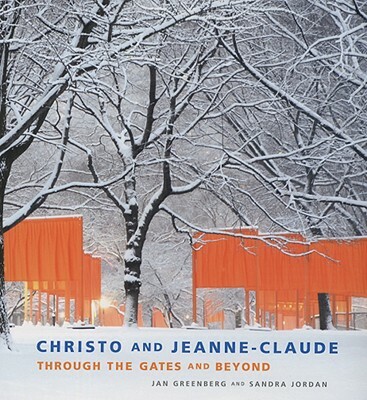 This biography of contemporary artists Christo and Jeanne-Claude is a story of the power of collaboration, and vision, and of the creation of the spectacular Gates and other renowned artworks. "Christo and Jeanne-Claude" is a 2003 Bank Street - Best Children's Book of the Year. Written by the unmistakable Jan Greenberg and Sandra Jordan, two of America's most prominent writers about art and artists for young readers, "Christo and Jeanne-Claude" is an absolute inspiration. Jan Greenberg lives in St. Louis, Missouri. Sandra Jordan lives in New York, New York.Other art-related books by Jan Greenberg and Sandra Jordan include "Action Jackson" (a Sibert Honor Book), as well as books on Van Gogh, Frank O. Gehry, Andy Warhol, and Chuck Close. "In an immoderately engaging profile of arguably the most visible and widely known public artists alive today, Greenberg and Jordan retrace the duo’s career and capture a sense of the wonder that their large-scale projects evoke....Based largely on interviews with the artists, this perceptive study is illustrated with big, eye-filling color photos—capped by a terrific foldout view of Christo at work in his shabby (last painted in 1964), cluttered New York studio. Quoting Jeanne-Claude’s provocative “It has no purpose. It is not a symbol. It is not a message,” the authors challenge readers/viewers in simple but never simplistic language to think long thoughts about the nature of art and their own personal responses to it."